If you want a no-fuss, highly accurate pedometer to track your daily walking steps, the Yamax Digi-Walker SW-200 is a great choice. Research has shown it to be the most accurate old-school pedometer on the market, used as the gold standard to judge other pedometers in research studies. The drawback is that the belt clip is made of plastic and some users report it breaking. Also, you really need a pedometer leash for it as I find it pops off my waistband during restroom stops. Step counting pedometer — that's its only function. You wear it on your waistband, it has an attached belt clip. Flip case design, open it to see your step count. You can reset the step count whenever you want, a feature preferred by some walkers who want to track a specific walking workout. Replaceable battery should last most of a year. Counts steps with high accuracy for an old-school pedometer you wear on your waistband. The flip case protects the reset button, making it harder for you to accidentally reset your step count when you didn't intend to do so. It's simple and the display is large enough for aging eyes. Not everybody wants a Fitbit tracking their every movement and storing that data somewhere online. With this unconnected pedometer, your steps are private. You don't have to keep recharging it every few days like most fancy fitness trackers, the battery will last for many months. It only counts steps, that's it. No calories, distance, active time, etc. You must wear it on your waistband for it to be accurate, it is not accurate carried in a pocket, etc. A security strap (pedometer leash) is absolutely necessary as otherwise you will have it popping off your waistband and you will lose it or launch it across the restroom. Users report the plastic clip is prone to breaking. It doesn't have a memory function and it doesn't connect to an app or computer. You'll need to record your steps before you hit the reset button, after that they are gone forever. 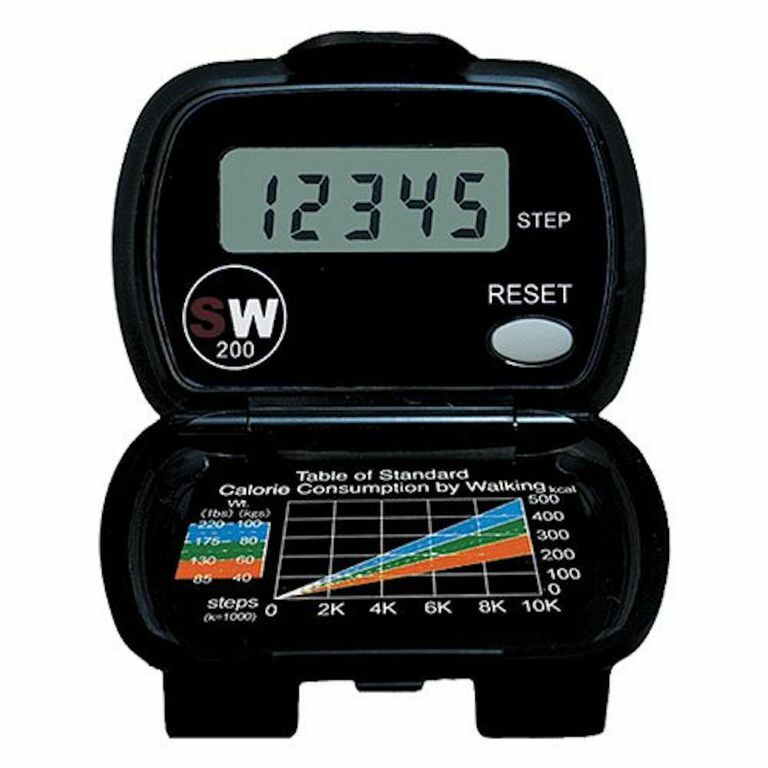 If you want to increase your walking steps each day, this basic pedometer will help keep you moving. It has a single function — it counts steps, and you just hit the reset button when you want to reset it to zero. The flip case prevents you from accidentally resetting it — a problem with other pedometers without protected buttons. It clips to your waistline and you can wear it comfortably all day. I highly recommend getting it with the security strap as its clip does not keep it on my waistband when pulling my pants on or off for restroom stops. You need to wear it on your waistband, centered over your knee for the best accuracy. It won't be accurate carried in a pocket. Researchers at the University of Tennessee found it to be highly accurate for counting your daily steps and treadmill steps. In fact, you might want to wear one to see how accurate your fancy fitness tracker really is!